The U.S. is estimated to lose more than half of the energy it generates – mostly because it escapes as waste heat. Scientists are now developing a new type of system to efficiently capture some of that lost heat. They have designed a surface that enhances low frequency thermal radiation, which is easier than higher frequencies to “harvest” directly out of the air and turn it into usable DC electricity. A rectenna metamaterial surface with bow-tie antennas for capturing 10,000 to 100,000 times more thermal energy for conversion to DC electricity. Image Credit: Won Park/University of Colorado. Click image for the largest view. The researchers described the surface at the AVS 62nd International Symposium and Exhibition, being held Oct. 18-23 in San Jose, Calif. Objects that heat up from wasted energy emit electromagnetic oscillations, similar to the alternating current (AC) that powers homes and businesses, said Won Park, an electrical engineer at the University of Colorado Boulder. The difference is the frequency of the oscillation – the electricity from a wall socket in North America oscillates 60 times a second, compared to the tens of trillions of oscillations per second for most thermal radiation from hot objects. When you plug a device like a computer into the wall, electronic circuitry in the computer’s power supply converts the AC oscillations into direct current (DC) that the device can use. The AC to DC conversion is done by an electronic component called a rectifier. Similarly, electromagnetic oscillations in the air can be turned into DC current by a device called a rectenna, which combines an antenna’s function of receiving electromagnetic waves with a rectifier’s function of outputting direct current. Current rectenna designs work best at lower frequencies. Yet waste heat from hot objects can push into the 100 THz (100 trillion cycles per second) range. Park and his colleagues found a way to enhance thermal emission of the hot bodies at the lower end of the spectrum (around 1 THz) by manipulating the surface of the object. Park’s team uses software to analyze how the nanoscale topology of a surface – its bumps, holes or grooves – changes the way that electromagnetic radiation interacts with the surface. In some instances the geometry supports the formation of a wave of rippling electronic charges, called a plasmon, that hugs the surface. “We design the surface to support a surface wave, because the presence of the wave offers a new avenue for engineering thermal emission,” Park said. For the case of optimizing thermal energy harvesting, the researchers found they could “spectrally tune” a surface to emit more radiation at 1 THz frequency. The researchers first optimized the design, which consists of a copper plate with a regular array of tiny holes, using simulations. They then built the design in the lab and confirmed that the plate did indeed produce the type of surface waves predicted by the simulations. 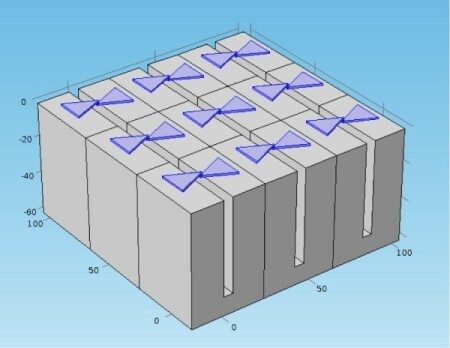 The researchers also used computer modeling to design a bow tie shaped antenna that would effectively capture the enhanced thermal emission. Simulations predict that an antenna placed near the holey surface could capture 10,000 to 100,000 times more thermal energy than a rectenna in open space. The team is in the process of experimentally testing this prediction and hopes to have new results to report soon. The results will also help the team calculate how rectenna thermal energy harvesting might compare to other ways of harvesting waste heat, such as thermoelectric materials. Park’s presentation is one of many at the AVS meeting about the technology of rectennas. Park notes that other teams will discuss approaches to improving the performance of rectennas at higher frequencies, as well as ways to optimize large arrays of rectennas. Presentation EM+AS+SS-MoM6, “Metamaterial Enhanced Rectenna for Efficient Energy Harvesting,” was at 10:00 a.m. on Monday, Oct. 19. The research described in this story is funded in part by a grant from Redwave Energy Inc. The rectenna idea has been around for years, maybe now the approach of modifying the heat source emission can get us closer to using the one half of the energy we buy and lose back to work.